I wonder how many people actually understand the meaning of living life on purpose and make an effort on a daily basis to live the life of their dreams with determination and enjoyment. In fact what does it mean to live life on purpose, after all each of us has our own standard of what success looks like. Satisfaction, realizing your dreams, success whatever you want to call it always condenses down to how you choose to live your life and the level of desire to create more and meet your heart’s desire. Earlier today I was again brought up short with the realization that even though we live in an era of superfast technology and incredible advancements in medicine there is only one guarantee in life, which is, we are each born to live a life of choosing. That’s right, we each have a choice therefore there is no need for any of us to live in ‘victim mode’ because no matter who and where you live you’ll only exist in that kind of lifestyle, until you choose to change it. You see when you decide to choose you begin to live your life on purpose and as if by magic the forward moving opportunities will cross into your path. Over the years as I’ve pursued the study of personal development and made it my mission to have access to some great mentors. What they had to share with me has changed the way I think and my life. Regardless who the teacher may have been the final outcome, the result was always good because each time I was stretched even further out of my comfort zone and shown how I could within my world make the changes necessary to take me up to the next level. Throughout my self-improvement journey I have come to learn about the bigger, bolder picture and the five phases of personal success. Knowing what these five phases of personal success are will be of no use to you unless you actually have the intention to quash and remove every emotional doubt and fear that is currently impacting upon your values and confidence levels and are truly ready to take the necessary action that is involved in breaking through the barrier of limiting beliefs so you can experience a wonderful transformation that will support your ideal lifestyle as you move from strength to strength. I’ve made the study of personal development and the habit of taking action on what I learn in my life. It’s for that reason I live my life by design and you can too. 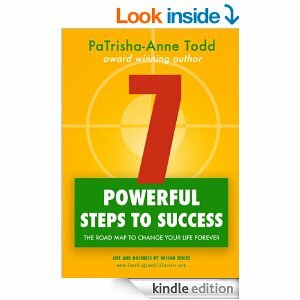 In my book ‘7 Powerful Steps To Success’ I explain how you can see the bigger picture for yourself and how you can transform your lifestyle step-by-step as I guide you through the five phases of personal success. If you take action and apply the 7 powerful steps you’ll reap the benefits of the principles of personal success simply by learning how to feed your mind with courage, freedom and opportunity as you move steadily towards your goal.